The successful second launch attempt of the Space Shuttle Discovery carried a crew of five and the ATLAS 2 into space. 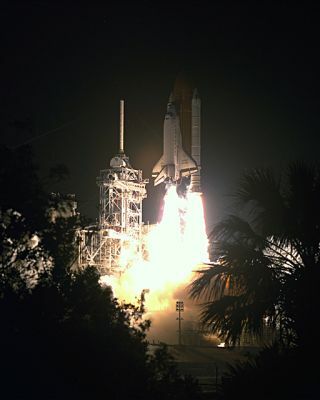 In this historical photo from the U.S. space agency, the second try works like a charm as the Space Shuttle Discovery lifts off from Launch Pad 39B on Mission STS-56 at 1:29:00 a.m., EDT, Apr. 8, 1993. The first attempt to launch Discovery on its 16th space voyage was halted at T-11 seconds on April 6. Aboard for the second Space Shuttle mission of 1993 are a crew of five and the Atmospheric Laboratory for Applications and Science 2 (ATLAS 2), the second in a series of missions to study the sun's energy output and Earth's middle atmosphere chemical makeup, and how these factors affect levels of ozone.